Pictured: Flood damage at the Hobas Lodge in the Fish River Canyon where a 22-year-old man drowned. 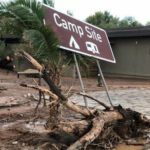 The 22-year-old Ben Henry Markus died tragically when a flash flood at the Hobas Lodge in the Fish River Canyon swept away the tents in which he and eight other people were sleeping on Friday night. Markus and his fellow campers were just some of the thousands of people that were caught off guard by the record amounts of rain that fell over the breadth of southern Namibia during Friday night as none of the people expected flash floods to turn normally dry river beds into raging torrents and to inundate roads. The deceased Markus was an employee of the Namibia Wildlife Resorts and was camping at the well known lodge when the tragedy occurred. Deputy Commissioner Chrispin Mubebo, //Kharas Regional Crime Investigations Coordinator confirmed the untimely death of the young man on Saturday and said the incident occurred at about 21:00 on Friday evening. He said the group was camping at the resort and when the heavy rain started, workers only heard a loud noise possibly caused by the torrent of floodwater rushing down the riverbed before the tents in which the people slept disappeared. People rushed to the aid of those caught in the wild water and managed to rescue the eight survivors. The lifeless body of Markus was discovered on Saturday morning about twelve hours after he and the others were swept away on the river’s bank further down in the canyon. Besides the tents being washed away by the flash flood, the Hobas Lodge was also inundated with water and workers has already started the arduous process of mopping and cleaning up. In an official statement the NWR said the Managing Director Zelna Hengari rushed to the scene of the tragedy to access the damage and to assist workers who lost a colleague. “It is extremely unfortunate that we lost one of our young staff members from one of our other camps. I would like to pass on my condolences to his family and assure them that they are in our prayers and have our support as a company”. The statement also cautioned the public to be extra careful if they intend to visit Hobas Lodge which is located in the /Ai-/Ais – Richtersveld Transfrontier Park. In the meantime other communities in the south also started to assess the damage caused by the record amount of rain. A few hours after the tragedy at Hobas a bus full of passengers was forced off the road by a flash flood on the road between Keetmanshoop and Grunau. When the sun rose on Saturday morning those involved in rescuing the bus passengers realised that another tragedy was averted. When the flood water receded a badly damaged road was revealed. Several secondary roads to smaller towns in southern Namibia have been damaged by the rain and in some places are almost not passable at all. Motorists have exercise extreme caution when using the roads because it is very slippery in some places and rivers have damaged low water crossings. The road to /Ai-/Ais and Koës are just some of the badly damaged roads where extreme caution have to be exercised.